Wagner James Au sez, "AI algorithms, as AOC recently pointed out, often have a racial bias inherited by their creators, to the point where some can't even 'see' people of color. Afrofuturist Nettrice Gaskins teaches Deep Dream's AI to be aware of great black faces on a deep level." “I used Deep Dream Generator's algorithm, which is inspired by the human brain," she tells me. "The generator uses the stylistic elements of one image to draw the content of another. The first picture defines the portrait I want to create and the second picture I upload gives the program a style to simulate. The process may include more than one pass in the generator, using different style images, until I get the image I want." 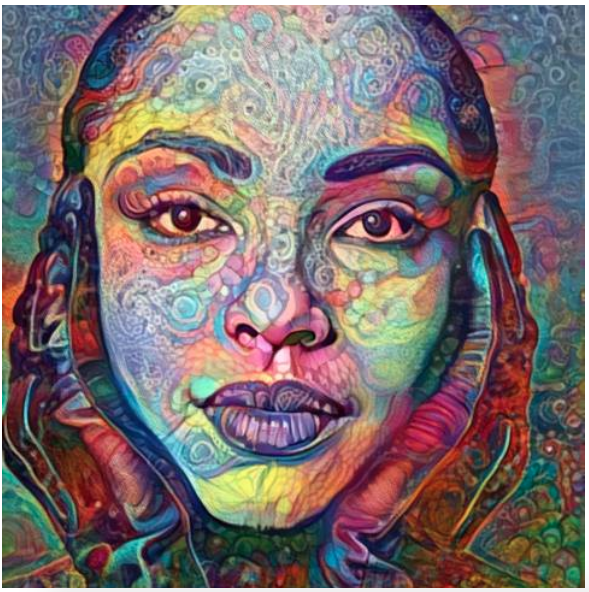 This portrait of Sade, for instance, "[Is] a composite of multiple Deep Dream images."